If you are ever jogging down a gravel road, remember that this is a bad time to take your lucky rock out of your pocket to admire it. On the other hand, a hole in one would probably be easier to get. I’d just pick the one closest to the hole. If it melts later, grab another one. Oh, and if you drop your lucky rock on a gravel path, it ain’t that lucky. 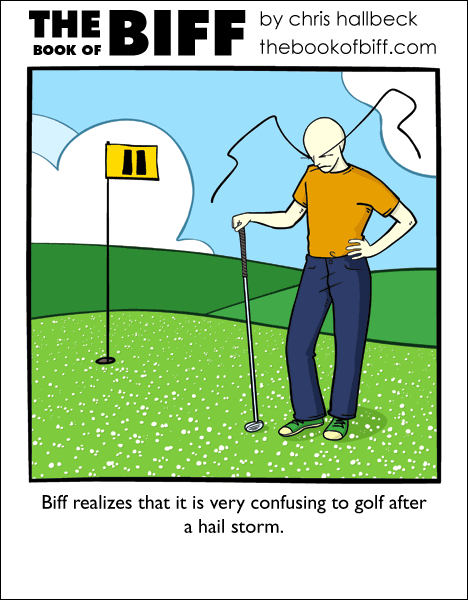 Only after golf-ball sized hail storms. How’d he not get hit by lightning? @micah- He did, but his Biffbrows act as lightning rods. They run all the way down his body to the ground, except most of the hair is as pale as Biff. Had a crazy hail storm here about a month or two ago. Ripped a bunch of leaves out of all the trees. I had to laugh later when I saw a minivan drive by, coated in leaves. Looked like some sort of Greenpeace parade float. One of the funniest I’ve seen. I’ve often wondered about that myself. I just read about a story where someone was thrown off his toilet by hailstones flooding out of the commode. Ouch! I cracked open a hailstone out of curiousity once. They’re pretty weird. I think I was able to separate out the layers from one another with my fingers, and I had a little ice hemispheric shell. Bah… My lucky rock is a piece of quartz with a silver patch at one end… I can take it out where ever I like. My lucky rock was a piece of tiger’s eye. It got lost/stolen in junior high. I live in Florida, so I’ve never experienced a snow or hailstorm. Funny. Biff always has gags I wish I would have thought of myself. @bellows:Maybe it started hailing in the middle of his game? Is that the Pause’th hole? . . . . \ \ . .
A recent page from my “366 Stupidest Things Ever Said” calendar quoted a news report that the midwest had been pelted with “hail-sized golf balls”. Just struck me really funny for some reason. I feel like the description underneath makes today feel like a double-punchline, since there’s no full-on story in there. I’m gonna call sports and weather week. @ Chris – Has this happened to you? The anecdote I mean. My guess is needle in a haystack week. If you’re ever biking down a gravel path, don’t take any sharp turns, for you will slide.